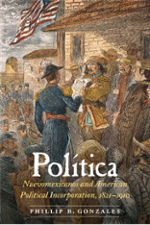 Política offers a stunning revisionist understanding of the early political incorporation of Mexican-origin peoples into the U.S. body politic in the nineteenth century. Historical sociologist Phillip B. Gonzales reexamines the fundamental issue in New Mexico’s history, namely, the dramatic shift in national identities initiated by Nuevomexicanos when their province became ruled by the United States. Gonzales provides an insightful, rigorous, and controversial interpretation of how Nuevomexicano political competition was woven into the Democratic and Republican two-party system that emerged in the United States between the 1850s and 1912, when New Mexico became a state. Drawing on newly discovered archival and primary sources, he explores how Nuevomexicanos relied on a long tradition of political engagement and a preexisting republican disposition and practice to elaborate a dual-party political system mirroring the contours of U.S. national politics. Política is a tour de force of political history in the nineteenth-century U.S.–Mexico borderlands that reinterprets colonization, reconstructs Euro-American and Nuevomexicano relations, and recasts the prevailing historical narrative of territorial expansion and incorporation in North American imperial history. Gonzales provides critical insights into several discrete historical processes, such as U.S. racialization and citizenship, integration and marginalization, accommodation and resistance, internal colonialism, and the long struggle for political inclusion in the borderlands, shedding light on debates taking place today over Latinos and U.S. citizenship. In November 2015, the University of Chicago Press published A Shared Future: Faith-Based Organizing for Racial Equity and Ethical Democracy by Richard L. Wood (UNM Department of Sociology) and Brad R. Fulton (Indiana University School of Public and Environmental Affairs). The book analyzes contemporary organizing for racial equity in the United States, particularly within organizations that include white, African-American, Latino, and other diverse participants building shared commitment to racial equality. 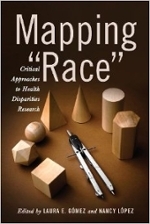 Recently reviewed in the American Journal of Sociology. Review by: Osagie K. Obasogie. American Journal of Sociology, Vol. 120, No. 4 (January 2015), pp. 1234-1236. More than six million Americans—most of them women—have been diagnosed with fibromyalgia syndrome (FMS), a disorder that produces muscular-skeletal pain and fatigue. In the absence of visible evidence, a well-understood cause, or effective treatment, many have questioned whether FMS is a "real" illness. Amidst the controversy, millions of women live with their very real symptoms. Rather than taking sides in the heated debate, Kristin Barker explains how FMS represents an awkward union between the practices of modern medicine and the complexity of women's pain. Using interviews with sufferers, Barker focuses on how the idea of FMS gives meaning and order to women beset by troubling symptoms, self-doubt, and public skepticism. The Fibromyalgia Story offers a fresh look at a controversial diagnosis; Barker avoids overly simplistic explanations and empathizes with sufferers without losing sight of the social construction of disease and its relation to modern medical practice. From Gandhi's movement to win Indian independence to the Arab Spring uprisings of 2011, an expanding number of citizens have used nonviolent action to win political goals. While such events have captured the public imagination, they have also generated a new surge of scholarly interest in the field of nonviolence and civil resistance studies. Although researchers have produced new empirical data, theories, and insights into the phenomenon of nonviolent struggle, the field is still quite unfamiliar to many students and scholars. In Nonviolent Struggle: Theories, Strategies, and Dynamics, sociologist Sharon Nepstad provides a succinct introduction to the field of civil resistance studies, detailing its genesis, key concepts and debates, and a summary of empirical findings. Nepstad depicts the strategies and dynamics at play in nonviolent struggles, and analyzes the factors that shape the trajectory and outcome of civil resistance movements. The book draws on a vast array of historical examples, including the U.S. civil rights movement, the Indonesian uprising against President Suharto, the French Huguenot resistance during World War II, and Cesar Chavez's United Farm Workers. Nepstad describes both principled and pragmatic nonviolent traditions and explains various categories of nonviolent action, concluding with an assessment of areas for future research. In the spring of 1989, Chinese workers and students captured global attention as they occupied Tiananmen Square, demanded political change, and were tragically suppressed by the Chinese army. Months later, East German civilians rose up nonviolently, brought down the Berlin Wall, and dismantled their regime. Although both movements used tactics of civil resistance, their outcomes were different. Why? In Nonviolent Revolutions, Sharon Erickson Nepstad examines these and other uprisings in Panama, Chile, Kenya, and the Philippines. Taking a comparative approach that includes both successful and failed cases of nonviolent resistance, Nepstad analyzes the effects of movements' strategies along with the counter-strategies regimes developed to retain power. She shows that a significant influence on revolutionary outcomes is security force defections, and explores the reasons why soldiers defect or remain loyal and the conditions that increase the likelihood of mutiny. She then examines the impact of international sanctions, finding that they can at times harm movements by generating new allies for authoritarian leaders or by shifting the locus of power from local civil resisters to international actors. As the nuclear arms race exploded in the 1980s, a group of U.S. religious pacifists used radical nonviolence to intervene. Armed with hammers, they broke into military facilities to pound on missiles and pour blood on bombers, enacting the prophet Isaiah’s vision: “Nations shall beat their swords into plowshares and their spears into pruning hooks.” Calling themselves the Plowshares movement, these controversial activists received long prison sentences; nonetheless, their movement grew and expanded to Europe and Australia. In this book, Sharon Erickson Nepstad documents the emergence and international diffusion of this unique form of high-risk collective action. Drawing on in-depth interviews, original survey research, and archival data, Nepstad explains why some Plowshares groups have persisted over time while others have struggled or collapsed. Comparing the U.S. movement with less successful Plowshares groups overseas, Nepstad reveals how decisions about leadership, organization, retention, and cultural adaptations influence movements’ long-term trajectories.